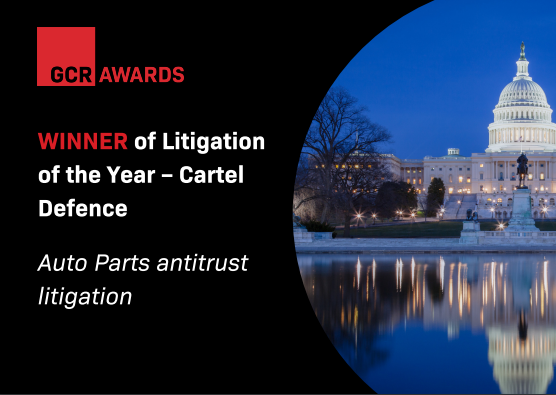 Kerr Russell attorneys, Fred Herrmann, Joanne Geha Swanson, & Matthew Powell, on winning the Litigation of the Year – Cartel Defence award for Auto Parts antitrust litigation at the Global Competition Review 9th Annual Awards Ceremony. The GCR awards are selected by readers who were invited to vote for the cases, law firms, lawyers, economists and enforcers they believe excelled in 2018. Fred K. Herrmann maintains a diverse litigation and alternative dispute resolution practice across a wide range of industries. Joanne Geha Swanson has more than 30 years of experience as a litigator and appellate attorney. Matthew L. Powell practices in the areas of litigation and general business law, with an emphasis on complex commercial litigation. Kerr Russell congratulates Fred, Joanne, and Matthew on this incredible achievement!